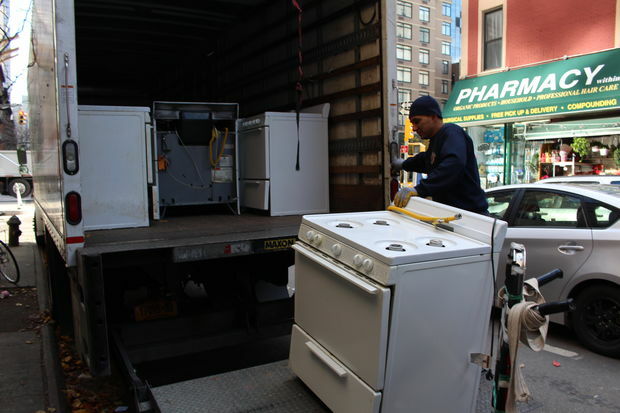 LENOX HILL — Seniors at the Robbins Plaza public housing building were surprised with more than 100 new stoves and 100 refrigerators delivered to their homes. Assemblywoman Rebecca Seawright secured $400,000 in funding for improvements to Robbins Plaza, a senior-designated building at 341 E. 70th St. and First Avenue, $120,000 of which were used to purchase 102 stoves and 105 fridges. Deliveries started Thursday and will continue through Dec. 12. "I was so surprised," said longtime Robbins Plaza tenant Matilda, who declined to give her last name. "The stove wasn't in good shape...I didn't use it because it was old and I couldn't turn on the flame." The existing fridges and stoves were roughly 15 years old, officials said. Many fridges were broken or had damaged seals around the doors and couldn't keep the cold inside, according to New York City Housing Authority spokesman Gerard Middleton. Many of the units were beyond repair or simply too dirty to salvage, according to Nancy Rodriguez, the Robbins Plaza housing assistant. Apifania Tirado, who has lived in the building for 12 years, said she's been wanting a new refrigerator for some time because her fridge would sporadically break down. "My fridge was out again," Tirado said. "They helped me and I'm grateful. I'm gonna tell everybody." The tenants' old ovens were being hauled out on Friday, some of which appeared completely useless. The rest of the funding that Seawright secured will go toward other capital improvements at the housing development, but what those improvements will entail is still being worked out, she said. "The seniors are so happy," said Lovelle Watts, president of the building's tenant association. "Until now, it's been wishing and hoping that someone could see the need. It's so important to have someone fight for us. Seniors are the forgotten people."